Beautifully engraved certificate from the Cambridge Railroad Company issued in 1859. This item is hand signed by the Company's President and Treasurer and is over 144 years old. The first section of the 3 mile Cambridge Railroad was opened between Boston and Cambridge on March 26, 1856, beating a rival line into operation by the purchase of secondhand cars from the Brooklyn City Railroad. In order to popularize its service, the Cambridge line tried the novel idea of letting everyone ride free, and within a week it was transporting more than 2,000 passengers a day. After some two months of free transportation, the line's conductors began to ask for fares. The public was outraged at this imposition. Many demanded that the company's franchises and privileges be revoked, and a few extremists even suggested that the line's officials should be hanged on Boston Common�" from "Time of the Trolley," 1967, by William D. Middleton, pages 15, 16. PART II: A CHRONOLOGICAL LOG OF IMPORTANT INCIDENTS AFFECTING THE M.B.T.A. 1793 Stagecoach began operating between Cambridge and Boston. 1826 First Omnibus in Boston area began operation: Boston to Cambridge. March 26, 1856 First Horse Line in this region operated by Cambridge Railroad from Harvard Square, Cambridge to Cambridge and North Grove Streets, Boston. November 12, 1887 West End Street Railway absorbed Metropolitan Railroad, South Boston Railroad, and Boston Consolidated Street Railway. 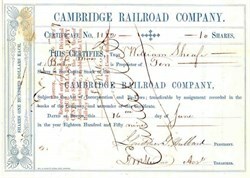 November 19, 1887 West End absorbed Cambridge Railroad. February 20, 1888 The Meigs Elevated Railway, an experimental steam monorail, opened. April 2, 1888 Electric power used successfully on Lynn & Boston Street Railway. January 1, 1889 First electric cars operated from Allston to Park Square, Boston via Coolidge Corner, Beacon Street, Mass. Ave., and Boylston Street. First Carhouse for electric cars and first power station on Braintree Street, Allston. June 18, 1891 The Rapid Transit Commission appointed by the Governor and Mayor of Boston to perform a study of Boston transportation needs. April 6, 1892 Rapid Transit Commission Report issued recommending the construction of elevated lines around Boston and the construction of a trolley subway under Tremont St. and Boston Common. July 2, 1894 Boston Elevated Railway Company organized. August 15, 1894 Boston Transit Commission organized. March 28, 1895 Transit Commission began construction of Tremont St. Subway. September 1, 1897 Tremont Street Subway--Public Garden through Boylston Street Station to Park Street Station opened. October 1, 1897 Tremont Street Subway--Pleasant Street to Park Street Station opened. December 30, 1897 Boston Elevated Railway took possession of West End Street Railway having leased it since October 1, 1897. September 3, 1898 Tremont Street Subway--Park Street through Haymarket, Adams Square, and Scollay Square to North Station. March 30, 1899 Boston Elevated Railway began construction of Elevated from Sullivan Square to Dudley Street.